The following is an extended version of a review that I published in 2010 on the Web and in the Newsletter of the Mozart Society of America. This book – which is the most amazing festival of Mozart related nonsense published in the last ten years – would normally be of very little interest. But the fact that it was partially funded with Austrian taxpayers' money, makes it worthy of a more detailed treatment. I recently came across a "scholarly" Mozart project (initiated by the Mozartgemeinde Wien and also funded by the City of Vienna's culture department) whose results are so ludicrously worthless that I decided to revisit Krzeszowiak's book and to concern myself with other enterprises of this splendid public institution called "Kulturabteilung der Stadt Wien". This book makes a formidable initial impression, containing numerous reproductions of well-known images and some less known documents. The author, a professor of engineering, has approached his topic with great enthusiasm; he attempts to collect all the research on the history of the Theater auf der Wieden in a single volume, a project made possible with the financial support of the Austrian Ministry of Science and two Austrian federal state governments. Unfortunately closer inspection reveals serious problems characteristic of many amateur historians. 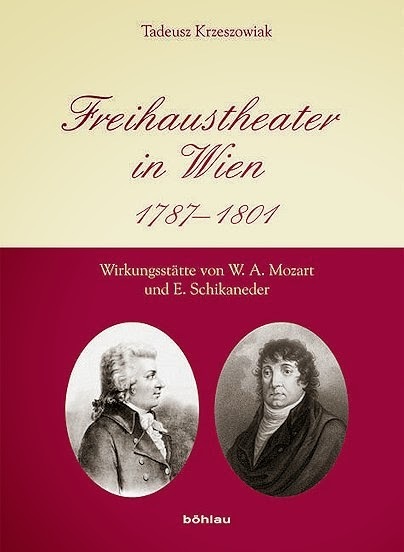 Krzeszowiak presents himself as a pioneer, offering new sources to the reader, yet he seems unaware of nearly all previous scholarly research on Vienna's Freihaus and the Wiednertheater. He has obviously established his own parallel universe of make-believe Mozart scholarship, where he pretends to be a pioneer of archival research. With the exception of a few theater posters (given with erroneous shelfmarks), there are actually no "photos and documents presented here for the first time" as advertised in the blurb. It has been decades since Otto Erich Deutsch and Else Spiesberger published the Linz archival material on the Freihaus, and the plans in the Lower Austrian Federal Archive in St. Pölten were the subject of my presentation in 2006 in Brussels and my 2008 article "Neue Forschungsergebnisse zum Theater auf der Wieden und Emanuel Schikaneder" in the journal Wiener Geschichtsblätter. Ignaz von Seyfried's "Journal des Theaters an der Wien", parts of which Krzeszowiak presents in transcription (rife with amusing errors and Seyfried's signature presented as "illegible"), has been available complete since 1997 in Stephan Punderlitschek's transcription, and Anke Sonnek also transcribed much of the manuscript in her 1999 book about Emanuel Schikaneder. Had Krzeszowiak been aware of David J. Buch's publications over the last twelve years on this theater's repertory, he would have been able to give correct dates and titles for pieces. For example Emanuel Schikaneder's Der wohltätige Derwisch was already in the repertory of the Theater auf der Wieden in 1791 and was not first performed in 1793, as Kreszowiak claims. He would also have been aware of the surviving musical and textual sources from the theater that Buch has discussed in numerous publications. Krzeszowiak's citations from eighteenth-century periodicals and cited archival shelfmarks are taken almost exclusively from older German-language secondary literature (particularly the writings of Anton Bauer and Carl Glossy). Because he uses shelfmarks that are outdated by decades (such as "Archiv des Landes Niederösterreich, Wiener Stadthauptmannschaft, Akt Nr. 161 ex 1800 ƒƒ. "), sometimes from archives that were disbanded right after WWII ("Archiv der Ministeriums für Inneres und Justiz") and because he faithfully repeats the errors in the secondary literature, it is obvious that he never personally examined the majority of these documents himself. Concerning the Freemasonry documents in the "Vertrauliches Archiv" in the Haus-, Hof- und Staatsarchiv Krzeszowiak diligently copies all the shelfmarks from the secondary literature and presents them as if this material had not been published elsewhere decades ago, thereby staging himself as pioneering researcher. Moreover, there is not a single transcription in this book without mistakes. No archival source is cited with the correct shelfmark. Countless words, easily recognized by readers familiar with contemporary Kurrentschrift, are merely indicated as "illegible". The fact that the author has only a marginal knowledge of the Mozart literature results in a continuous stream of absurdities. 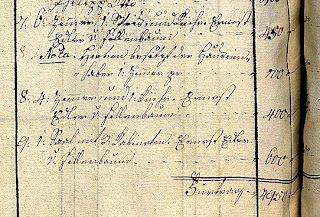 For example, Krzeszowiak claims to provide the "first" transcription of Mozart's marriage certificate. In actuality this document has been transcribed and published decades ago, and in a far more accurate and complete manner than Krzeszowiak's botched transcription. Krzeszowiak reproduces the plans of the Freihaus in black and white, failing to understand the significance of the colors that separate actual structures from proposed building projects. Roughly half way into the book the author suddenly changes to a topic that has nothing to do with the title of the book: "Mozart 1756-1791. Aspects of Biography." Here too we encounter a jumble of inaccuracies and errors that have long since been corrected by Mozart scholarship. The nonsense compiled in this book never fails to amaze. We learn that Schikaneder used "live[!] 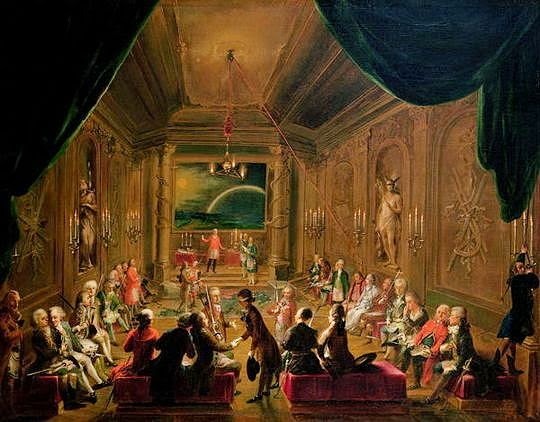 lions, monkeys and snakes" in the performance of "Die Zauberflöte"; that "Gluck himself chose Mozart as his successor as court musician"; that Mozart received "a fee of 900 gulden" for Così fan tutte (only 450 gulden are documented); that Franz de Paula Hofer "was a violinist in Schikaneder's troupe" (he was a court musician) and that Schikaneder "was expelled from the freemasons, because in the 'Zauberflöte' he had betrayed one of their secret initiation rituals". 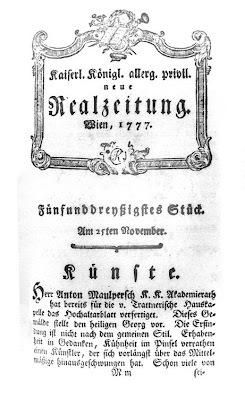 Josepha Hofer's 1790 contract with Schikaneder is copied right out of Rudolph Angermüller's deeply flawed book MOZART 1485/86 bis 2003 (Tutzing: Schneider, 2004). But Krzeszowiak did not realize that Angermüller's version of this document is a mere torso (presenting only three of nine paragraphs), because Angermüller just copied the text from two pictures which were published on the internet, when in 2006 the contract was auctioned by the firm Otto Haas. Just like Angermüller, Krzeszowiak is unaware of the fact that Emil Karl Blümml already published this document in its entirety in 1923, when it still belonged to Franz Josef Böhm. Krzeszowiak presents us with a "Constanze van Nissen", a "Franz Xaver Mozart" (all through his life his first name was Wolfgang), a "National-Hoftheter", a month by the name of "rber" (recte "7ber", i.e. September), a monthly rent of 130[!] gulden for one of Mozart's apartments, Joseph von Bauernfeld as "Unternehmer des Wiedner Hof und Gerichtsadvokat. Theaters", and syphilis as cause of Franz Xaver Süßmayr's death. The author claims that Mozart was buried in a mass grave, together with other corpses; that a painting of a supposedly Viennese lodge includes portraits of Mozart and Schikaneder and that a photograph of Max Keller's family shows Constanze Mozart. The first issue has been settled recently in a post of mine on this blog. The erroneous assumption that the painting of a lodge in the Wien Museum actually shows Mozart was caused by the late H. C. Robbins Landon, who, a freemason himself, failed to realize that the two persons on the far right of the picture both wear a golden angle on their chest. In my aforesaid article about Schikaneder and the Theater auf der Wieden I pointed out that these angles are the exclusive insignia of the lodge's chairman and the first supervisor which precludes the identification of the two individuals as Mozart and Schikaneder. The notorious "photograph of Constanze Mozart" issue was caused in 2006 by a hallucination of an Altötting archivist, who was so heavily afflicted by the "2006 Mozart anniversary craze" that he dug up a carton curio which had already been published by Erich Herrmann Müller von Asow in 1958 in the Österreichische Musikzeitschrift. But of course neither naivete nor gullibility of journalists can alter the well-documented history of photography. Owing to the lack of doublet achromatic lenses, which were not yet widely available in 1840, there are no short-exposure open air group portraits from that time. The earliest daylight photographs of this kind are Carl Ferdinand Stelzner's group portraits of the "Hamburger Künstlerverein", taken on 6 May 1843 (one year after Constanze Mozart's death), at the summer inn on the Caffamacherreihe in Hamburg. 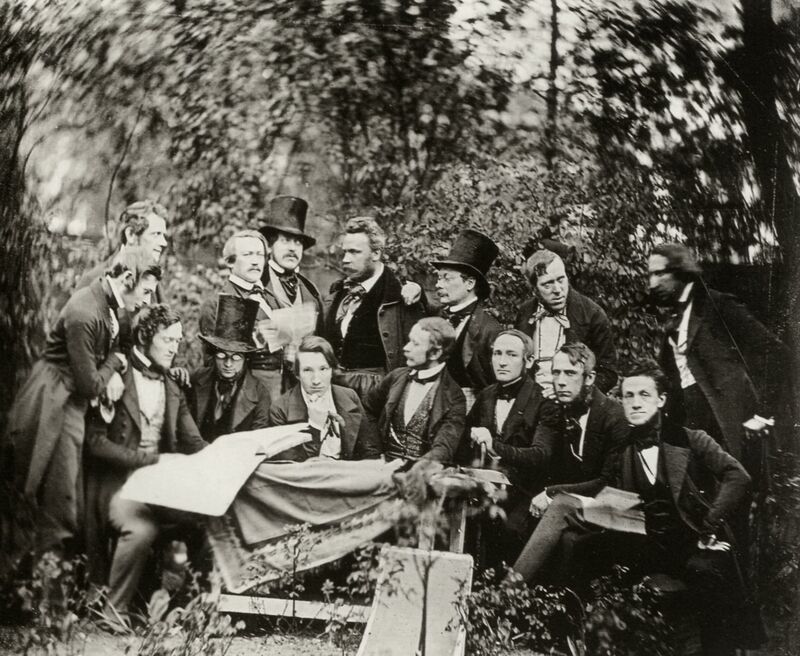 One of Stelzner's 1843 group portraits of the Hamburger Künstlerverein, one of the earliest open air photographs of a group of people (Museum für Kunst und Gewerbe Hamburg). The second photograph, taken on the same day, can be seen here. Note the typical circular distortion (Bokeh) of an early Petzval lens. We encounter such faulty readings as "Jacob …. CugHauptmann" (actually Jacob Edler Herr v Schickh Kreishauptmann), "Johann Thams (actually Thomas) von Trattner" as godfather of Mozart's son, as well as the note that "Herr Mayer" in 1800 performed the role of "Anraux" (this singer's name was Meier and the role was Aeneas). Mistakes also occur when Krzeszowiak reads printed sources, for example, he was not even able to correctly transcribe the Zettel of the "Zauberflöte" premiere (turning Mozart from a "Kammerkompositeur" into a "Hofkompositeur"). Benedikt Schack's opera "Die geplagten Ehemänner" ends up as "Die geplanten Ehemänner", the comedy "Die schlaue Nanette" becomes "Die schöne Nanette", and Neukäufler's "Der Rothgärbers Sohn" repeatedly appears as "Der Rothgräbers Sohn" (this is not a typo, the author simply does not know better). One finds numerous incorrect proper names such as "Karl Gorifchet's Buchhandlung" (recte Gorischek's), "Oskar Teuber" (recte Teubner), "Reghini" (recte Righini) and "Händl" (recte Händel), and flawed original citations being disingenuously presented as if they are complete and accurate (for example the quotes from Blümml's and Gugitz's book Alt-Wiener Thespiskarren on p. 72 and Friedl's Vertraute Briefe on p. 169). How Josepha Hofer, "ein Mädchen von 8 Grafen[!] in 1799 performed "im[!] Conzert auf dem Pianoforte" at a "muskialische[!] Akademie" has to be seen to be believed – and keep in mind that these goofs illustrate the general quality level of the whole book. The book lacks a bibliography and a list of primary sources; instead the end of the volume contains a series of advertisements by sponsors. More than 100 typos are proof that the book never received a thorough proofreading and editing. But even with such corrections, one would be left wondering why the author did not consult experts in the field in order to produce a credible and more focused study. Two questions remain after the reading of 496 pages: 1) Did Professor Krzeszowiak really think that he was doing pathbreaking new research? And 2) Should such a bizarrely flawed book not be taken as an opportunity to rethink the funding of such publications with taxpayers' money and try to involve independent, if possible foreign experts into the distribution of these funds? © Dr. Michael Lorenz 2013. All rights reserved. 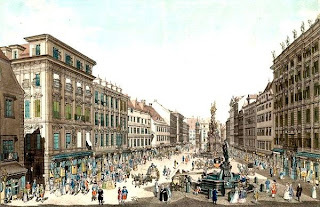 Mozart's second child Carl Thomas was born on 21 September 1784 in the Trattnerhof on the Graben. 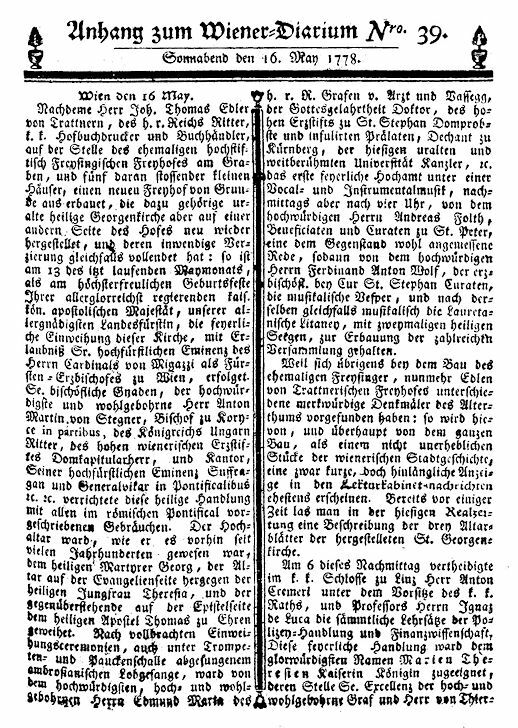 The abbreviation "Herbstm" on the far left does not mean "Herbstmond", but "Herbstmonat" (which arises from the printed header at the top of the column). The current number "92" of the baptism is missing. The abbreviation "M." in the mother's name does not mean "M(utter)" but "Maria". This document shows that the mother's wrong family name "Ueber" in the clean copy, published by Blümml, was caused by a sloppy "W" in the original entry from 1784. 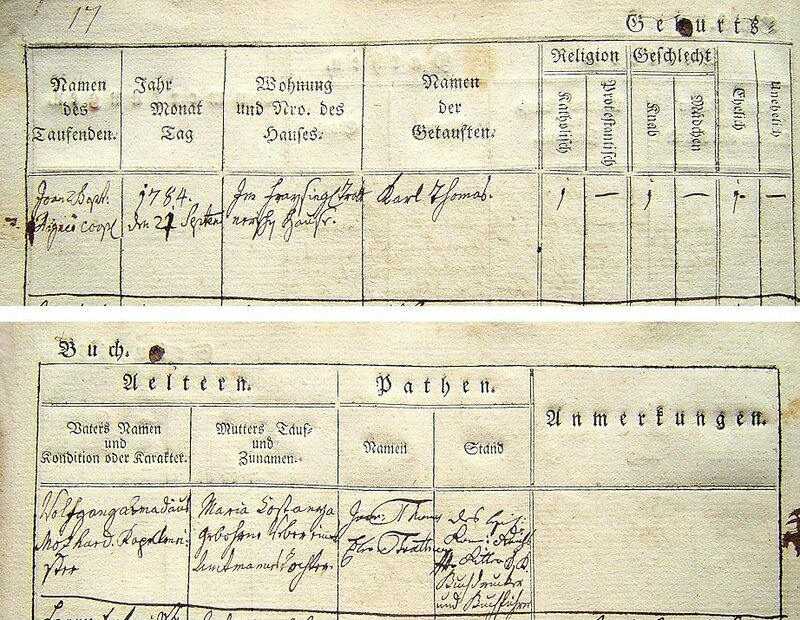 The midwife – whose name is not given in the records – was most likely Franziska Sidler (1720-1797). She had already helped deliver Mozart's first son in 1783. The Trattnerhof was located in her district. Johann Thomas Edler von Trattner's autograph signature in the original 1784 baptismal entry: "des Heil: Rom: Reichs Ritter K.K. Buchdrucker und Buchführer". Trattner's bust in the church in Wienerherberg which is a work by Johann Martin Fischer. The Trattner family mausoleum is located behind the Wienerherberg parish church. Until now nobody has ever asked the not so far-fetched question why Mozart's second son was named Carl. Why did Mozart not try to make up for his faux pas one year earlier, when he disappointed his father by naming his firstborn "Raimund Leopold", instead of "Leopold Raimund"? "Leopold Thomas" would have been quite an obvious choice of names for the second child. Was Carl Mozart's eponym already Mozart's friend Carl Prince Lichnowsky whose mother Maria Carolina, Princess Lichnowsky (1741-1800) was among the subscribers of Mozart's Trattnerhof concerts? 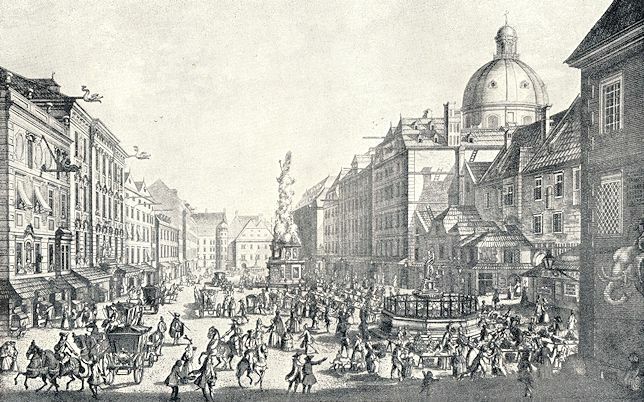 On 27 May 1773 the publisher and printer Johann Thomas von Trattner was granted permission by the City Council of Vienna to tear down five medieval buildings and the so-called Freysingerhof on the Graben and replace them with a huge tenant-occupied building which was to be located between the Graben and the Goldschmiedgasse. In March 1773 Trattner had bought the Freysingerhof and the adjoining houses for an overall sum of 60,000 gulden. 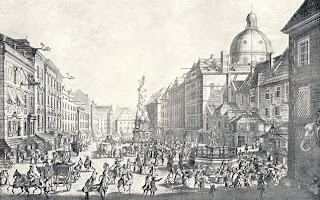 A view of the Graben towards north-west in 1719. The slightly set back building on the right is the Freysingerhof, on the far right is the "Elefantenhaus". The cupola is that of St. Peter's Church. The Freysingerhof on the 1710 Steinhausen map. St. Peter's Church is at the bottom right. 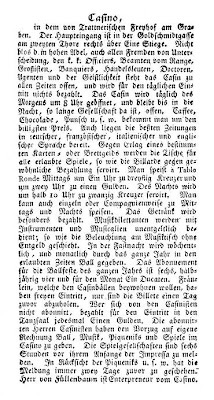 Trattner's application to the Vienna City Council to get the permission to build the Trattnerhof. This application was presented to the council on 8 May 1773. An on-site inspection in the presence of eight owners of adjoining houses took place on 15 May 1773 at 8 a.m.
Trattner's architect Peter Mollner designed a six-storeyed building with an irregular groundplan which was finished in 1776. The building had four staircases, five small atriums and three yards, two of which were directly accessible through four entrances. The two doors facing the Graben were both flanked by two huge atlantes by Tobias Kögler who also made the ten statues and the eagle which adorned the eaves. 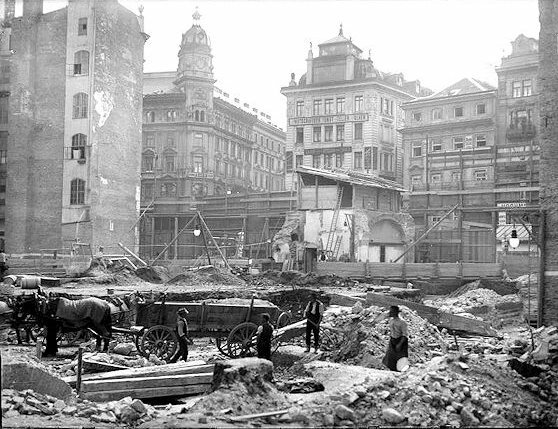 The maximum length of the building was 78,86 m, its maximum width between thr Graben and the Goldschmiedgasse was 54,66 m. The overall cost of building the Trattnerhof amounted to 389,015 gulden and 7 kreuzer. After Trattner's death in 1798, the building's value was still estimated at 370,000 gulden. A (never before published) copy of the original design of the Trattnerhof's facade, drawn in 1809 by the engineer Joseph Dietrich on the occasion of a new roofing. 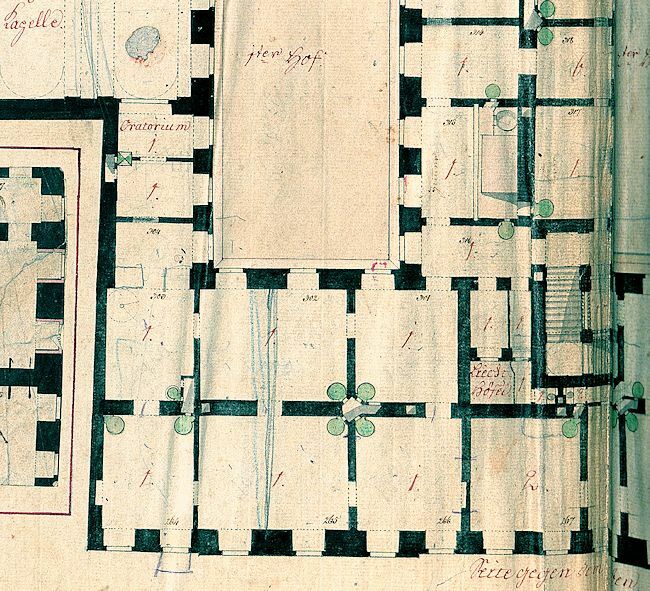 The green shutters and the sculptures on the roof were removed in the nineteenth century (A-Wsa, Handschriften A 326). The first entrance of the Trattnerhof at Graben 29 in 1910 with two of Kögler's atlantes, of which the right legendarily had his back turned towards the street (A-Wn, ST 2911F). These two atlantes are today held by the Wienmuseum (Inv. Nr. 117.160/1-2). Each of the five stories above the ground floor originally consisted of nine apartments which were accessible via four stairwells. 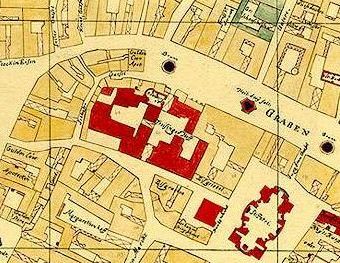 The annual rents of these apartments in 1788 ranged between 1,000 (the landlord's apartment with ten rooms on the second floor) and 100 gulden (one room and a cabinet on the sixth floor). The generally small apartments served the purpose of maximizing the rental revenue and soon after the Trattnerhof's completion tenants started to complain that the individual rooms were too small. One of the main problems which was caused by the building's location was the apartments' unsatisfactory supply with daylight. This was one of the reasons why the old Freysingerhof had had much bigger yards and why in 1911 the Trattnerhof was replaced with two buildings which today are separated by a street named "Trattnerhof". 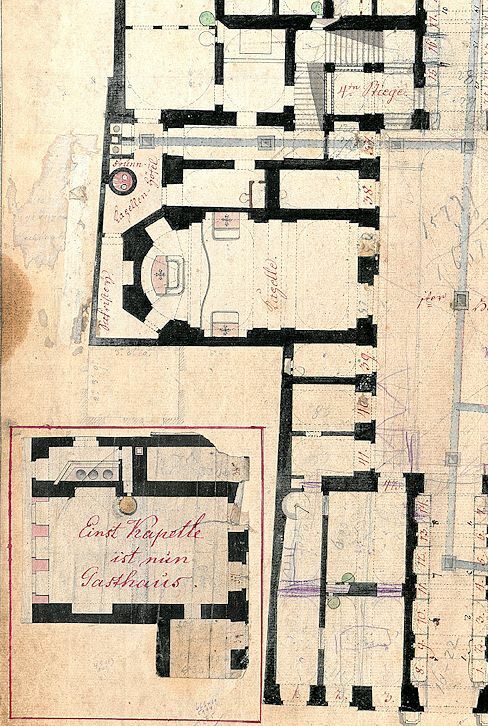 A previously unpublished elevation of the Trattnerhof, showing the two double basements, the three yards and the relative heights of the stories. 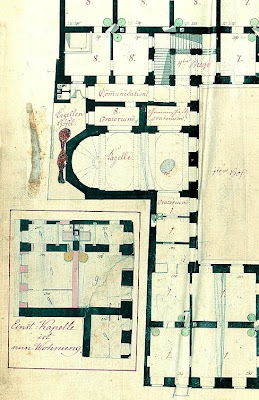 This plan was drawn in 1826 by Johann Langsteiner (A-Wsa, Handschriften A 326). 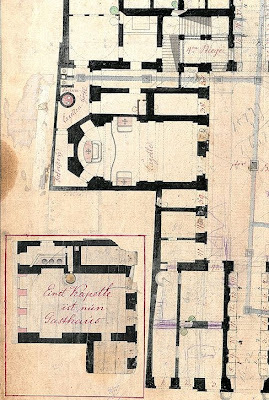 The previously unpublished plan of the Trattnerhof's ground floor (as seen from the Graben), showing the chapel, the "Gewölbe" (shops), stables, carriage sheds, two fountains, the sewage pipes and the four stairwells ("Stiegen"). The small "Stall=Hof" (stable yard) in the right wing was accessible through a ground floor passage from the second yard. This plan was drawn in 1777 by Peter Mollner's foreman Johann Michael Anthofer. The numerous handwritten notes originate from nineteenth-century modifications. 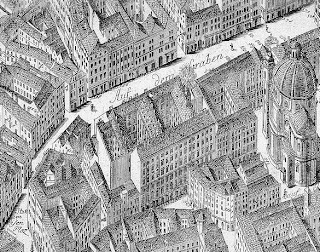 Mollner's original 1773 design did not have the rectangular recess on the upper right towards the Goldschmiedgasse (A-Wsa, Handschriften A 326). Between 1777 and the completion of the "Bürgerspital-Zinshaus" in 1790, the Trattnerhof was the largest privately owned building in Vienna's inner city. 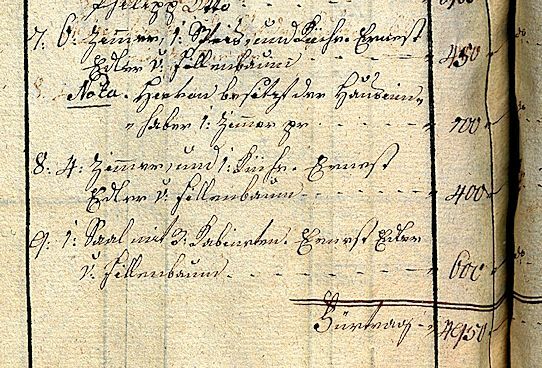 According to the 1788 tax register the annual rental revenue of the Trattnerhof amounted to 27,957 gulden 30 kreuzer. The architect of the building, Peter Mollner, also lived in the Trattnerhof. For 260 gulden a year he rented apartment No. 3 on the fifth floor which was located between the two bigger yards and was accessible via the first stairwell. When Mollner's daughter Anna Maria got married in 1791 she submitted the following certificate of residence, signed by her father and his landlord. 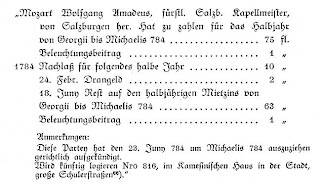 Peter Mollner certifying that his daughter Anna Maria lives with him, and Trattner attesting that Mollner has been his tenant for several years: "Daß dießes obige Attestat der wohledle Herr Peter Mollner bürgl: Baumeister viele Jahre in meinem Freÿhof N° 591 a 596 in der Stadt, im 4ten Stok. N° 3 wohnt, bezeuge hiemit. Wien d[en] 7 Merz 791 Johann Thomas Edler von TrattnernMp Innhober des Freÿhofs." That Trattner always signed himself as "Innhober" reflects on his Hungarian ancestry and his speaking accent (A-Wstm, VKA SP, 22/1791). A view of the Graben by Carl Schütz towards north-west from 1781. On the left is the Palais Bartolotti-Partenfeld, on the right is the Trattnerhof. 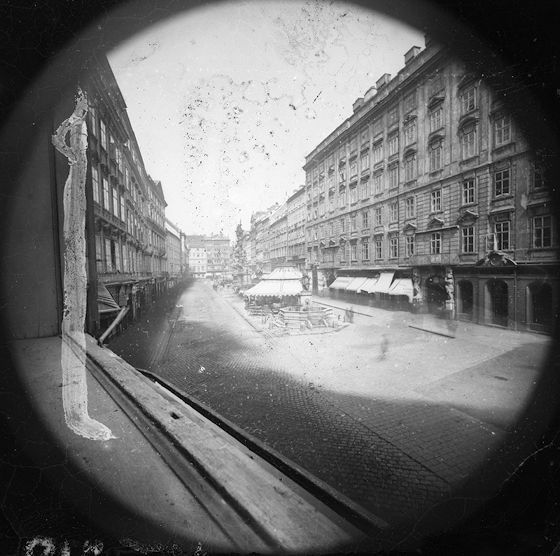 A view of the Graben towards south-east from before 1866. The tall building on the left is the Trattnerhof. In the background is the so-called "Elefantenhaus" No. 619. On the third floor (the fourth according to the North American scheme) four apartments were accessible from the second staircase which was located in the right wing of the building: Nos. 2, 3, 4 and 6 (of which the last could also be entered from the third staircase). The fourth floor ("3ter Stock") of the Trattnerhof's right (south-east) wing with the second stairwell ("2te Stiege") in the foreground. The numbering of the apartments on the plan corresponds with the numbers in the 1788 municipal tax register. The area seen here had no outside windows, because up to the third floor it was completely surrounded by the five adjacent smaller buildings Nos. 597-600 and 541 (A-Wsa, Handschriften A 326). The header of the entry is missing completely. It reads "3ter Stock, Wohnung No 4 auf der 2ten Stiege. Bestehet in 2. Zimmern und 3. Fenstern und Küche, in Stallhof, Retirade, Holzgewölb, Keller und Boden No 22." Also missing is the note "Hiezu gehören Requisiten 1. Glockenzug beÿm Eingang". The name sequence in the original certainly is "Wolfgang Amadeus Mozart". 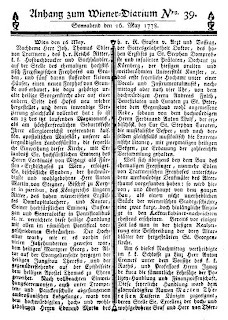 "Hat zu zahlen" (has to pay) is not just two words in a sentence, but another header of a separate column in a table on the left side of a double page entry. "Beleuchtungsbeitrag" is a term that did not exist in 1784 Vienna. It is obviously an arbitrary rephrasing of the original word "Lanterngeld" (lighting fee). The list of due payments cannot be correct, because it contains a discount of ten gulden which cannot be an item on a list of addenda. The obligatory final total of Mozart's payments is also missing. The complete second page of the entry is missing. It contains the corresponding list of items titled "Hat gezahlt." (has paid). Cloeter (or her assistant) obviously did not understand the two-page layout of the entries in the rental records. The passage "Wird künftig logieren Nro 816 im Kamesinischen Haus" in the note is flawed. Correct is "logiren" and "Nro 846". The entry in vol. V (1799-1811) of the Trattnerhof "Zinsbücher" concerning the letting of Mozart's former apartment to the French cook Jean Guihen Dunant in 1799. 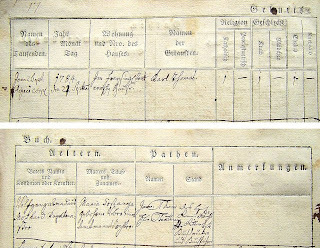 On the left are the dues, on the right the payments (A-Wsa, Handschriften A 325/1, p. 127f.). Karl Bandt, who in 1788 lived in Mozart's former apartment, was a "bürgerlicher Schneidermeister" (civil master tailor). By 1799 he had already moved up to the Trattnerhof's fifth floor into the bigger apartment No. 14 whose location corresponded with No. 6 on the third floor. Here is a bigger picture of Mozart's apartment in the Trattnerhof which consisted of two small rooms, a kitchen and a bathroom (Mozart's cellar and attic compartments No. 22 were located towards the Goldschmiedgasse in the Trattnerhof's right wing). 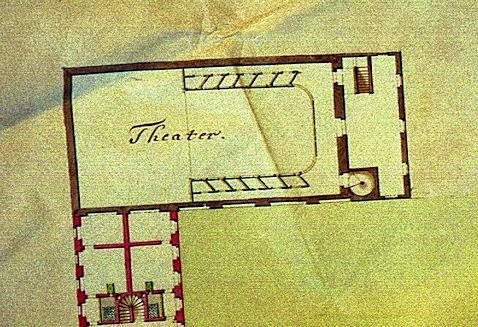 The plan of Mozart's three-room apartment on the third (fourth) floor of the Trattnerhof between the "Stall Hof" (stable yard) and the firewall towards the lower house Stadt No. 598 (on the right) which faced the Schlossergassel. The overall floor area of Mozart's apartment was 61,09 m², the height of the rooms on the fourth floor was 3,73 meters. As can be seen on the map the two ovens could conveniently be fired from behind, from a niche in the wall, accessible through a concealed door. Mozart's maid – who is mentioned in Mozart's afore-said letter to his father – had to sleep in the kitchen. Mozart had absolutely no space and no reason to give house concerts in his small living room as long as he had the hall in the Trattnerhof and Trattner's luxurious apartment at his disposal. It seems unlikely that he even had his piano transported back to his apartment between his concerts in March 1784. 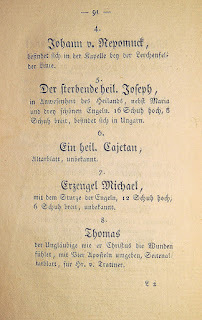 In April 1801 the Swabian dancing teacher Johann Stoppel and his family moved from apartment No. 4 on the second floor of the Trattnerhof into Mozart's former apartment. 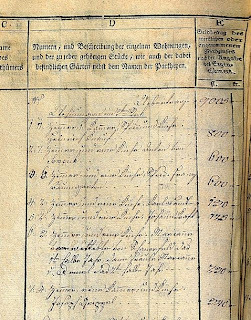 Since Stoppel on 30 April 1803 died in this very apartment, the list of his belongings in his "Sperrs-Relation" (probate file) provides an interesting look on how much furniture was put into Mozart's apartment. The list of Johann Stoppel's belongings in his probate records. On the bottom left is the signature of his widow Helena Stoppel (A-Wsa, Mag. 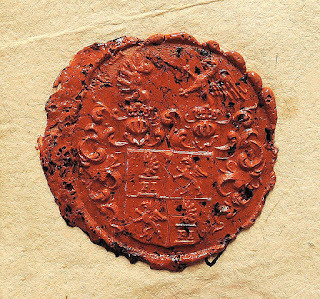 ZG, A2, 2242/1803). Stoppel's furniture consisted of "the conjugal beds, a wicker canapé, two hardwood tables, six chairs, a drawer cabinet, a mirror in a gilded frame, a pearl chandelier, two muslin curtains, two paintings, six china plates, some coffee dishes and the usual kitchen furnishings". Mozart's way of life in 1784 was extremely modest and economical. He cut down on expenses for housing space, because his interest and the lion's share of his financial clout were focused on the venue that was much more important to him than his living quarters: the house chapel in the Trattnerhof that had been remodelled into a concert hall. Because the old Freysingerhof had contained a chapel dedicated to St. George, Trattner felt obligated to fit the new building with a chapel as well. The new church was located on the north-western side of the Trattnerhof, wedged between the first yard and a back side corner of the house Am Peter No. 549 (which since 1761 had been owned by a son of Count Joseph Anton Gabaleon von Wackerbarth-Salmour). Owing to the cramped architectural situation (which made this part of the building badly suited for apartments in the first place) the chapel's apse had no windows. 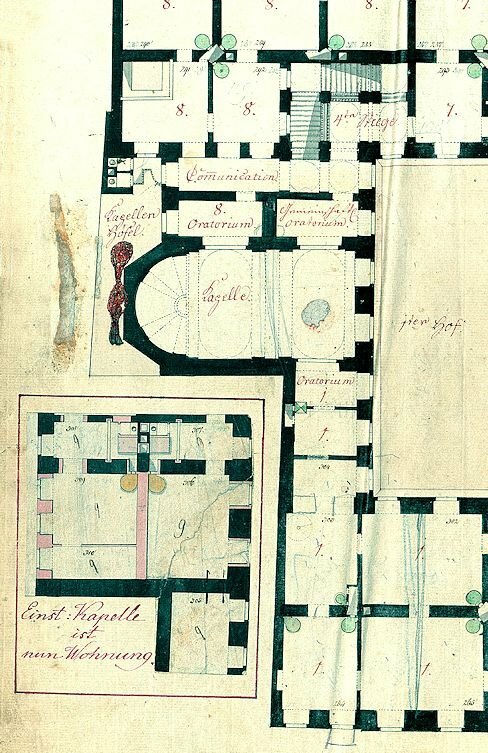 The narrow space between the apse and the adjacent building was used for a windowless sacristy and a small atrium ("Kapellen=Höfel") with a fountain. The chapel could be entered through the first yard ("1ter Hof") where two windows were located. Its overall height comprised three stories which amounted to 12,62 meters (more than two Viennese Klafter per story). Herr Anton Maulpersch K.K. Akademierath hat bereits für die v. Trattnerische Hauskapelle das Hochaltarblatt verfertiget. Dieses Gemälde stellt den heiligen Georg vor. Die Erfindung ist nicht nach dem gemeinen Stil. Erhabenheit in Gedanken, Kühnheit im Pinsel verrathen einen Künstler, der sich vorlängst über das Mittelmäßige hinaufgeschwungen hat. Schon viele von seiner Meisterhand verfertigte berühmte Stücke führen das Wort für ihn. Seine schönen Arbeiten werden von grossen Künstlern geschätzt und selbst von Unkennern gefühlet. In eben diese Kapelle hat Herr Felix Leicher ein Seitenaltarblatt, die heilige Theresia vorstellend, verfertiget. Die Zusammensetzung sowohl als das Kolorit entdecken uns an diesem Künstler einen glücklichen Schüler des Herrn Maulpersch. 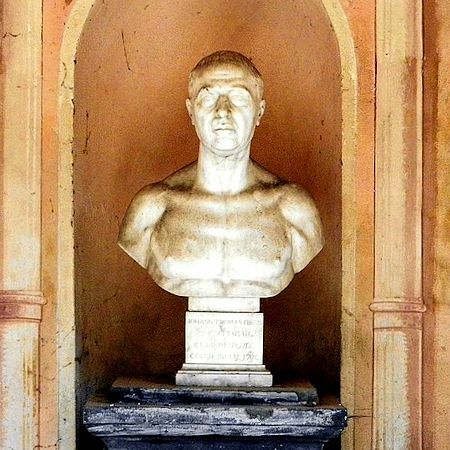 Herr Hubert Maurer, welcher in diese Kapelle ein Seitenaltarblatt, das den heiligen Thomas vorstellt, verfertiget hat, zeigt in der Gruppe sowohl, als im Faltenbruch und Kolorit, daß er während seines Aufenthalts in Rom die göttlichen Meisterstücke eines Raphaels und Coreggio genützt hat. Dieser Künstler verspricht Deutschland Ehre, da er sowohl in Historienstücken, als in Bildnissen seine Stärke zeiget. Mr. Anton Maulbertsch I. & R. Academy Councilor has already made the painting for the high altar of Mr. von Trattner's house chapel. This painting shows St. George. The invention is not in the ordinary style. Sublimity of thought and audacity of streak reveal an artist who for a long time has been soaring above the mediocre. Many famous pieces from his masterful hand speak in his favor. His beautiful works are estimated by artists and recognized by dilettantes. For this very chapel Mr. Felix Leicher has made a painting for a side altar showing St. Theresia. The composition as well as the colors reveal a very accomplished pupil of Mr. Maulbertsch's. Mr. Hubert Maurer, who for this chapel did a painting of St. Thomas for the side altar, shows in the arrangement of the folds and the colors in this group that during his stay in Rome he has made use of the divine masterpieces of Raphael and Correggio. This artist promises to bring Germany honor, since he is very accomplished in history paintings as well as in portraits. Maulbertsch and his colleagues Felix Ivo Leicher (1727-1812) and Hubert Maurer (1738-1818) also worked together on other occasions, for instance in the Piarist churches of Maria Treu and St. Thekla. The subjects on the altarpieces were of course chosen after the old chapel (originating from St. George Church in Freising) and the patron saints of Trattner and his second wife Maria Theresia, née Nagel (a goddaughter of Maria Theresia whom Trattner had married on 15 September 1776). According to the original summary account book, Maulbertsch received 350 gulden for the altar piece. Maurer was paid 300 fl. for his St. Thomas (plus 17 fl 4 x for a small John of Nepomuk) and Leicher (mistranscribed from her own notes as "R. Leipert" by Cloeter) received a fee of 200 gulden. According to its description in Johann Michael Sattler's book Lebensgeschichte des Hubert Maurer, Maurer's painting of St. Thomas showed the saint touching the wounds of Christ surrounded by four other apostles. Maurer's painting of St. Thomas appearing as "Seitenaltarblatt für Hr. 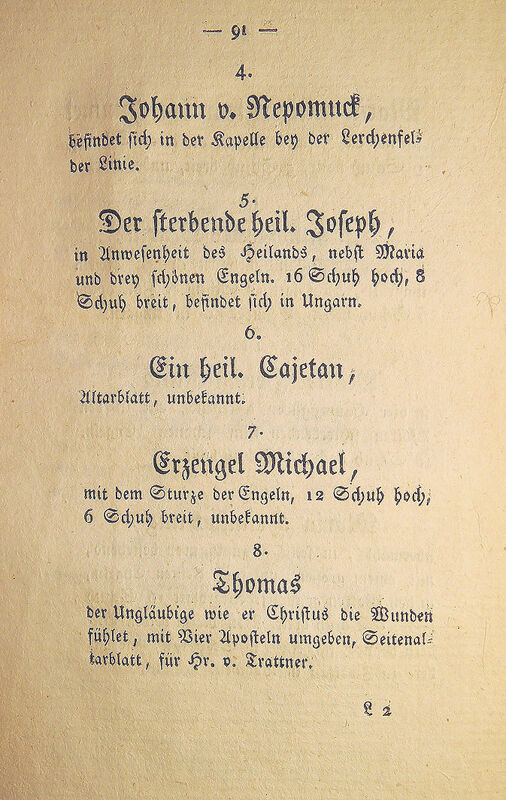 von Trattner" in the list of works in Johann Michael Sattler's Lebensgeschichte des Hubert Maurer (Vienna: Im Schrämblischen Bücherverlage, 1819). Sattler was Maurer's pupil and subtenant. In 1816 he married Maurer's maidservant and universal heiress Anna Maria Kittenberger. It is not known what became of the three altar pieces when the church was eventually closed. In 1963 a small sketch for the painting of St. George was discovered which today is held by the Wienmuseum. The new chapel in the Trattnerhof was solemnly consecrated and opened on 13 May 1778. 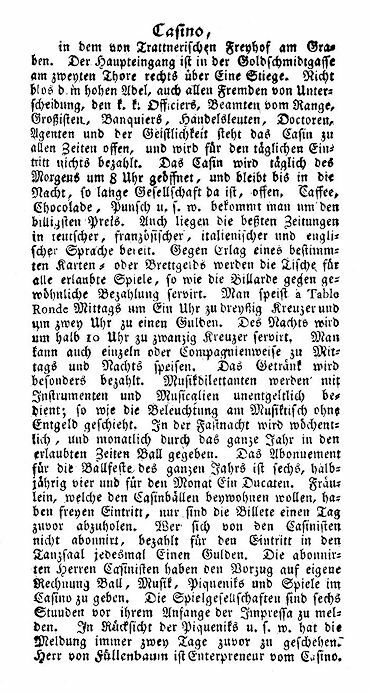 Three days later the supplement of the Wiener=Diarium published the following report (which also appeared in vol. 14 of Trattner's Wiener Lekturkabinets-Nachrichten). After the Knight of the Holy Roman Empire, the I. & R. court printer and bookseller Johann Thomas Edler von Trattnern has erected a completely new building on the location of the Freysing Freyhof and five adjacent buildings on the Graben, yet built anew the ancient and sacred St. George Church on the other side of the building and has likewise completed its internal decoration: thus on the 13th of the current month of May, which is the most joyful birthday of her gloriously ruling Imperial and Royal apostolic Majesty, our most gracious ruler, the solemn consecration of this church has taken place with the permission of his princely eminence Cardinal von Migazzi as Prince-Archbishop of Vienna. His episcopal Grace, the most honorable and noble Anton Martin von Stegner, bishop in Koryce in partibus [infidelium], knight of the Hungarian kingdom, lord capitular of the Viennese archbishopric, cantor, his princely eminence suffragan and vicar general in Pontificalibus etc. carried out this ceremony with all the customs required by the Roman Pontifical. As it had been the case for many centuries earlier, the high altar was dedicated to the holy martyr George, the altar on the Gospel [left] side on the other hand to the holy virgin Theresia and the one on the opposite Epistle side was consecrated to the honor of the holy apostle Thomas. After the consecration ceremonies were completed and the Te Deum had been sung with the sound of trumpets and tympanies, the first solemn High Mass with instrumental and vocal music was celebrated by the most venerable, high and most noble Count of the Holy Roman Empire Edmund Maria von Arzt und Vassegg, Doctor of Theology, dean of the archbishopric of St. Stephen's and insulated prelate, dean of Kürnberg and chancellor of the local ancient and widely famous university, etc. In the afternoon at four o'clock however a speech, which was most appropriate for the subject, was held by the venerable curate and beneficiate at St. Peter's, Andreas Folth, after which the venerable Ferdinand Anton Wolf, curate of the archiepiscopal Curia of St. Stephen's, held the musical vesper, followed by a musical Laurentian litany with two Holy Blessings for the uplifting of the many attendants. out of St. George's Church. 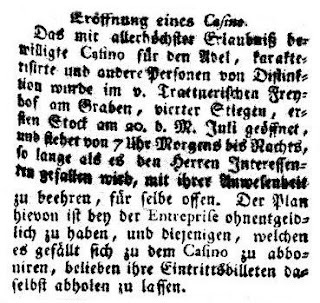 The above entry of course describes the situation after Ernest von Fillenbaum in 1784 had established his casino in the premises that four years earlier had served as a venue for Mozart's subscription concerts. Let me return to the original architectural situation of the chapel and its modifications which are well documented on the plans of the Trattnerhof. The rental ledgers show that by 1799 the former ground floor of the chapel had already been converted from a storage room into the seating area of an inn. This modification can be seen on a later addition to the original plan. Most of the ground floor of the chapel was replaced with a room whose additional layout is glued to the lower left corner of the plan, bearing the inscription: "Einst Kapelle ist nun Gasthaus." ("Formerly a chapel, is now an inn."). The apse was torn down and replaced with a wall (in pink color on the plan) that had three windows towards the narrow atrium. An oven was put into the main room and the small room beside the chapel was modified into a kitchen with a hearth. 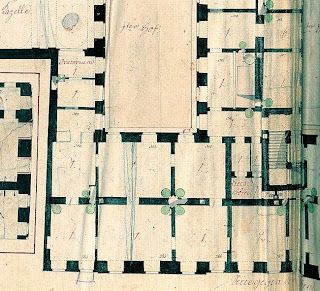 The plan of the second floor of the chapel in the Trattnerhof with a the additional plan of its modification on the lower left. The "4te Stiege" which provided access to the hall is visible at the top. 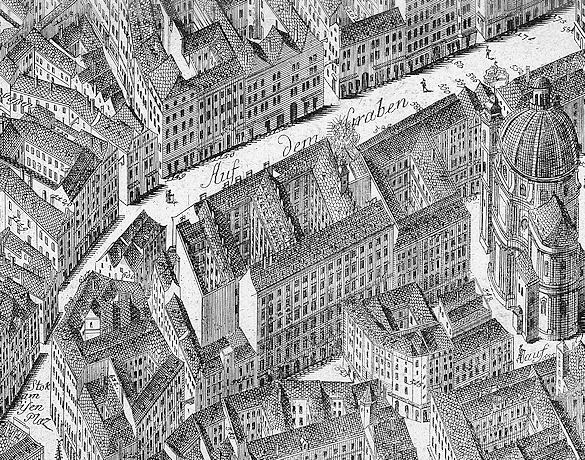 At the bottom right (bearing the number 1) is a part of Trattner's apartment (A-Wsa, Handschriften A 326). 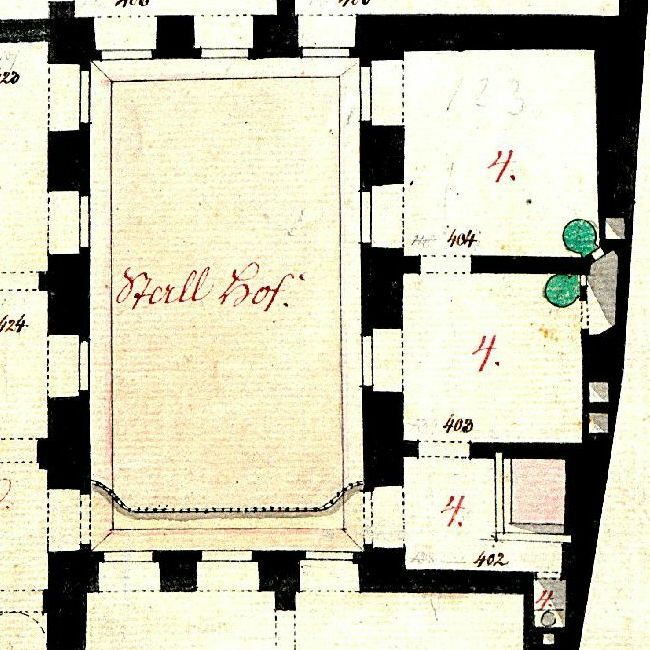 The plan of the second floor shows a similar situation: the modification of the bottom half of the former concert hall is documented on the additional layout on the lower left which is inscribed "Einst: Kapelle ist nun Wohnung." ("Once a chapel, is now an apartment."). Visible along the apse are still traces of red sealing wax which at some time was obviously used to glue the plan of the modification over the chapel's outline. 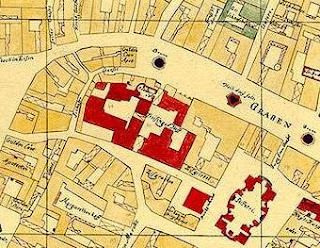 The three adjoing rooms marked "Oratorium" (oratory) served as parts of the Casino that was established in 1784. 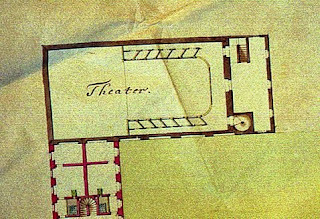 Because the new ceiling had separated the "zween Gewölbe" ("two storage rooms") on the ground from the remaining two thirds of the space of the former chapel in the second and third floor, the concert hall had now to be accessed from the Goldschmiedgasse on the back side of the building via the "4te Stiege" (the fourth staircase). Since its height comprised three floors, the chapel does not appear of the plan of the fourth floor (where Mozart's apartment was located). Mozart ist die Miete für den Saal gemeinsam mit dem Klavierspieler Georg Friedrich Richter eingegangen, heißt es doch Im Zinsbuch: "Georg Friedrich Richter et Wolfgang Amadeus Mozart, frstl. Salzburg. Kapellmeister." Als halbjährlich zu zahlen werden 550 fl. festgelegt. Da der Saal das erste Halbjahr leergestanden, wird diese Summe als Abzugspost geführt, der jährliche Bestandzins mit fl. 1100 eingesetzt. Die nächsten Berechnungsziffern unterm 24. Jänner 1784 scheinen sich auf Richter, den Mietpartner Mozarts zu beziehen. Dann aber steht: "20te do Wolfgang Amadeus Mozart für ebenfalls in dieser Fastenzeit gehaltene 3 musikalische Academien 9 oest. Dukaten id est 38 fl. 42 Kreuzer für die übriggebliebene Zeit wird der Zins abgeschrieben 433 fl. 54 kr." Mozart contracted the tenancy of the hall together with the pianist Georg Friedrich Richter, because the rental ledger states: "Georg Friedrich Richter et Wolfgang Amadeus Mozart, princely capellmeister from Salzburg." 550 florins were set as semiannual payment. Since the hall had not been used in the first half of the year, this sum is listed as deductible item and the annual rent is noted as 1,100 florins. The next numbers of the calculation, dated 24 January 1784, seem to refer to Richter, Mozart's joint tenant. Then the entry notes: "20th ditto Wolfgang Amadeus Mozart for three musical academies likewise given this lent 9 Austrian Ducats which are 38 florins 42 kreuzer. For the remaining time the rent of 433 florins 54 kreuzer is written off. 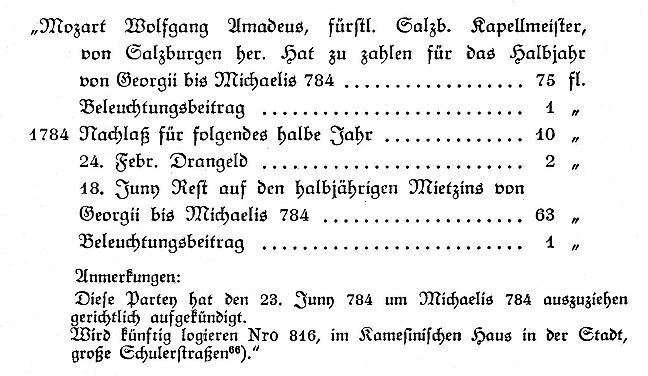 Trattner seems to have waived the biannual rent and charged Mozart only with a far smaller fee of nine Austrian Ducats (worth 4 fl 18 x apiece) for the three concerts in March 1784. What is unfortunately missing in Cloeter's partial transcription are the numbers concerning the payments of the other tenants. Cloeter's "20te[sic] do" makes no sense without the overall context. It would have been of essential value to know when exactly Richter and Fillenbaum became tenants of the hall and how much rent they paid exactly. Being overly focussed on Mozart, Cloeter was never up to the task of providing a basic and scholarly usable synopsis of the primary sources. I have received your letter of February 24th, It is much better to send your letters always by mail. On Monday I received your letter which, if you had sent it through Peisser's shop, I would have received only on Tuesday or Wednesday. I have not yet received the concertos, but I shall ask at Artaria's about them at once. You must forgive that I don't write very much, but it is impossible to find time to do so, as I am giving three subscription concerts in Trattner's hall on the last three Wednesdays of Lent, beginning on March 17th, for which I already have a hundred subscribers and until then shall easily get another thirty. The price for the three concerts is six gulden. I shall probably give two concerts in the theater this year. You may easily imagine that I must play some new works – therefore one must compose. The whole morning is dedicated to pupils and almost every evening I have to play. Below you will read a list of all the concerts at which I definitely have to play. But I must tell you quickly how it has come about that all of a sudden I am giving private concerts. The clavier virtuoso Richter is giving six Saturday concerts in the said hall. The nobility subscribed, but remarked that they really did not want to attend unless I played. So Richter asked me to play. I promised him to play three times and then arranged three subscription concerts for myself, to which they all subscribed. On 20 March 1784 Mozart sent his father the famous list of subscribers who paid an entrance fee of six gulden for three concerts at the Trattnerhof. 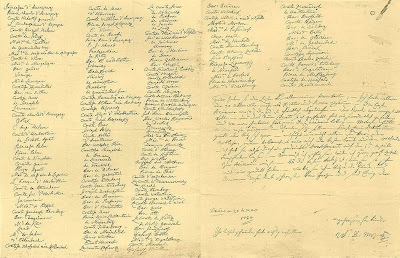 In his commentary to this letter Joseph Heinz Eibl gives a number of 176 subscribers, but actually the list contains 174 people, yielding Mozart a gross profit of at least 1,044 gulden. The concerts, at which Mozart played the concertos K. 449, 450 and 451, took place on 17th, 24th and 31 March 1784. Nothing is known about the other pieces that were certainly part of the three programs. 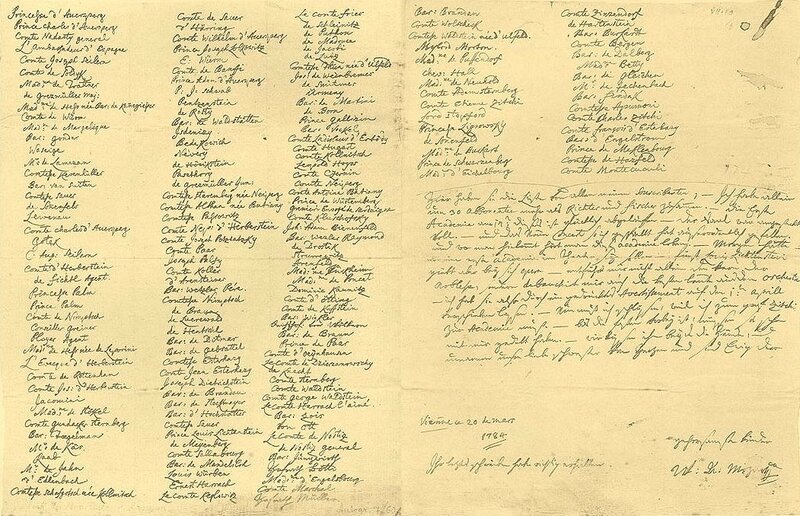 Mozart's letter of 20 March 1784 to his father with the list of his subscribers. The first leaf of this letter appears to be missing (A-Wn, Autogr. 7/60-6). Here you have the list of all my subscribers; I have 30 subscribers more than Richter and Fischer combined. The first concert on the 17th went well; the hall was crammed full and the new concerto that I played was very well received; wherever you go people are praising this concert. I beg you, don't be angry that I have not written for such a long time; you know how much I had to do in the meantime! My three subscription concerts brought me great honor. – My concert at the theater also went very well. [...] To tell the truth, I recently grew tired of all the playing, and it gives me no small credit that my audience never grew tired of it. Finally, how big was this casino/concert hall? If one suspects that 9 rows of 20 chairs were set up for the audience (9 x 20 = 180), with each chair say 20 inches across, then each row might be 34 feet across. Leave 3 feet on either side for moving around gives us 40 feet across for each row. With a chair depth of 20" and needing say 18" legroom, each row has a depth of 3,2 feet; so 9 rows take up just under 30 feet. Again, leaving 3 feet in the back to move around means that an audience of 180 people would take up about 40' x 33'. Adding a 10% unsure factor makes for a final total of 44' X 36'. An orchestra of 30 people plus a piano won't take up too much more space on its own than that set aside for the audience, meaning that this concert hall, ex-chapel, soon to be casino, could come out to be 72' by 44'. The fantastic estimate of 3,388 ft² (314,76 m²) for the size of the hall, resulting from the above calculation, seems more appropriate for a fairy-tale castle than for the Trattnerhof. The hall's actual size of barely 87 m² (936,46 ft²) and the high number of subscribers make it very clear however, that a predominant part of Mozart's audience had to stand during the concerts. Some of the older and weaker attendees probably had a number of chairs at their disposal, but the "crammed hall" was of course filled with standing listeners. This fact also reflects on the possible length of these concerts. The performance of a piano concerto and the well-deserved intermission was probably followed by a symphony and an improvisation as an encore. It is a general phenomenon in the Mozart literature that the size of Mozart's private concert venues in Vienna has been vastly overestimated. The biggest room of Trattner's apartment on the building's second floor, where according to a letter of 8 May 1784 Mozart also took part in a concert, had a size of 46,8 m². This size (like the hall in the Kaunitz palace at Freyung No. 120-21) was already above average. The concerts at the homes of Johann Michael Auernhammer (Stadt 428) and Gottfried Ignaz von Ployer (Stadt 756) took place in much smaller rooms. Trattner's apartment in the Trattnerhof (bearing number 1) on the second floor ("1ste Stiege"). 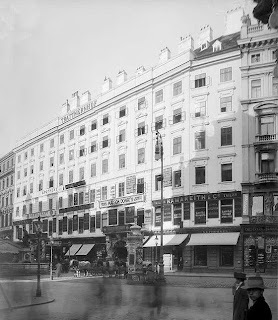 This apartment, facing the Graben, was the most luxurious in the building. 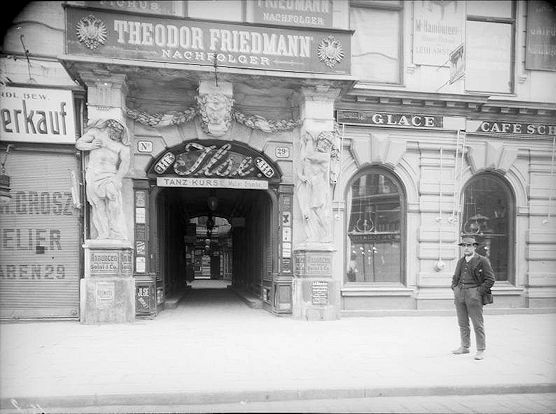 Trattner's private concerts probably took place in the second room from the left. The hall ("Kapelle") is visible at the upper left corner (A-Wsa, Handschriften A 326). Trattner's private concert in May 1784, which Mozart was referring to, did not take place in the hall, which is apparent from Mozart's phrasing: "Ich muß nun im ersten Stock hinab zu einer Akademie zur Frau von Trattnern" ("Now I must go down to the second floor to Frau von Trattnern"). The casino for the nobility, people of character and other distinguished persons which was granted the highest permission, has been opened on the 20th of this month in the von Trattner Freyhof, at the fourth staircase on the second floor and will be open from 7:00 a.m. into the night, as long as interested gentlemen will enjoy honoring it with their presence. A free map is availaible at the enterprise and thosw who want to subscribe at the Casino, should deign to collect their tickets there. That Fillenbaum's enterprise had already been running – albeit on a possibly smaller scale – in March 1784 is proved by a certificate of employment (A-Wstm, VKA SP, 254/1784) that Fillenbaum wrote for one of his waiters in August of the same year. By which I, the undersigned, certify thar Benedikt Kämerer, born in Franconia in Neustadt am Main, 31 years of age for the last five months has been employed by me as a waiter, and is also living at my quarters and that during this time in everything has behaved to my fullest satisfaction, which I affirm with my own signature and seal. Issued in Vienna on 23 August 1784.
on the second floor at the fourth staircase. in Trattner's Freyhof on the Graben. 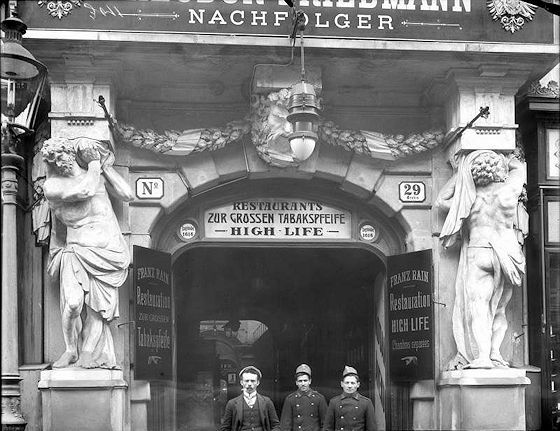 The main entrance is in the Goldschmidtgasse at the second door to the right via a staircase. The casino is open at all times, not only to the high nobility, but also to all foreigners of distinction, officers of the I. & R. military, higher state officials, wholesalers, bankers, merchants, doctors, agents and the clergy. The daily admission is free. The casino opens every day at 8 a.m. and remains open into the night as long as visitors are present. Coffee, chocolate, punch etc. are available at the lowest price. The best German, French, Italian and English journals are available as well. Upon deposit of a set fee for cards or a gameboard, tables will be provided at the usual price for all permitted games, as well as billiards. One may dine at the Table ronde at 1 p.m. for 30 kreuzer and at 2 p.m. for one gulden. At night dinner is served at 9:30 p.m. for 20 kreuzer. Dining is possible alone or in groups at noon or in the evening. Drinks are paid extra. Instruments and music are provided free for musical dilettantes. The lighting at the music desk is free as well. A ball is held weekly during Carnival, and monthly throughout the whole year at the permitted times. Subscription for the balls is six ducats for the whole year, four ducats for half a year and one ducat for a month. Young ladies who want to attend the balls in the Casino have free admission, but they must pick up their tickets one day in advance. Those who are not subscribers of the casino pay one gulden each time for entry to the dancing hall. Gentlemen who are subscribed to the Casino enjoy the advantage of having dances, music, picnics and games arranged in the Casino. Groups of players must be announced to the manager six hours before the start of the game. Regarding picnics the announcement must always be made two days in advance. Mr. von Fillenbaum is the entrepreneur of this Casino. By 1788 Fillenbaum not only was the renter of the hall, the adjoining rooms, and a spacious apartment, he also paid 120 gulden a year for a room and a larder on the fourth floor (right above the hall), where he probably housed some of his staff. Fillenbaum's single room and larder on the fourth floor of the Trattnerhof (A-Wsa, Steueramt B34/3, fol. 463). Ernest von Fillenbaum was born in 1753 the son of the "k.k. Postmeister" Ignaz von Fillenbaum and his wife Elisabeth, née von Fuchs. 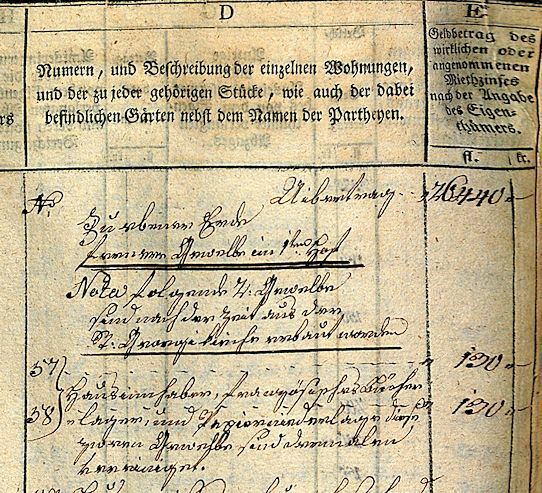 Since his probate records burned in 1927, it is not known for whom he worked as "herrschaftlicher Rechnungsführer" (lordship's accountant) at the time of his death on 13 February 1792 in Vienna's General Hospital. 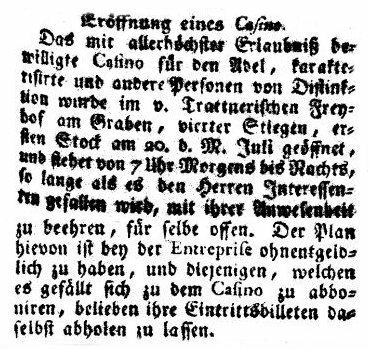 His casino enterprise at the Trattnerhof cannot have been too successful, because when he died he was 7,200 gulden in debt. 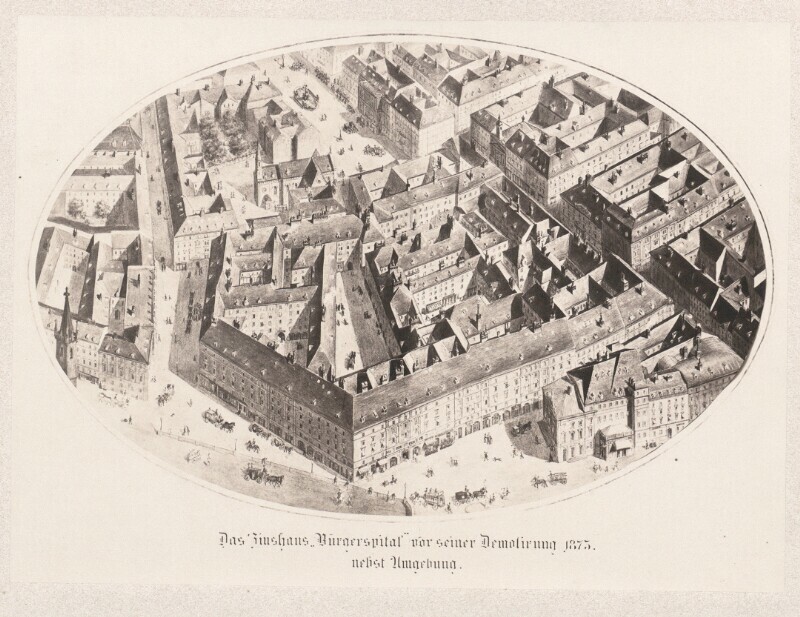 The Trattnerhof on Joseph Daniel von Huber's plan of Vienna. The area on the far left, where Mozart's apartment was located is slightly incorrect, because there is not enough space between the stable yard and the firewall towards the Schlossergassl. Note the small bell tower above the chapel. 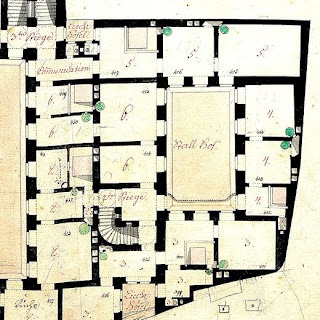 That the completed Trattnerhof appears on Huber's plan is proof that this plan cannot have been finished in 1773, as claimed by local historians. Mozart's two-room apartment in the Trattnerhof only had a size of 61 m² and was one of the smallest in the building. Mozart's main reason for moving into the Trattnerhof was the easy accessibility of the concert hall which ennabled him to make a relatively high profit within a short time. Mozart's close relationship to Trattner and his second wife, who was his piano pupil, reduced his rental expenses for the hall and made the composer's concert enterprise of spring 1784 even more successful. For a time of eight months Mozart cut his rental expenses and housing space in favor of his financial profit. In 1784 Mozart showed the approach of a savvy businessman. He took all the right steps to establish the foundation of the prosperity he was to enjoy in the following years. Owing to the hall's relatively small size of 86,9 m² Mozart's 174 subscribers had to stand during the concerts. This also curtails the lengths of the programs and makes all musings in the literature about "Mozart being accompanied by an orchestra of 30 musicians" completely untenable. The second entrance of the Trattnerhof at Graben 29A in 1910. To get to his apartment from the Graben Mozart had to pass this door (A-Wn, L 25557 - B). A view from the Goldschmiedgasse towards the Graben across the remains of the torn down Trattnerhof. 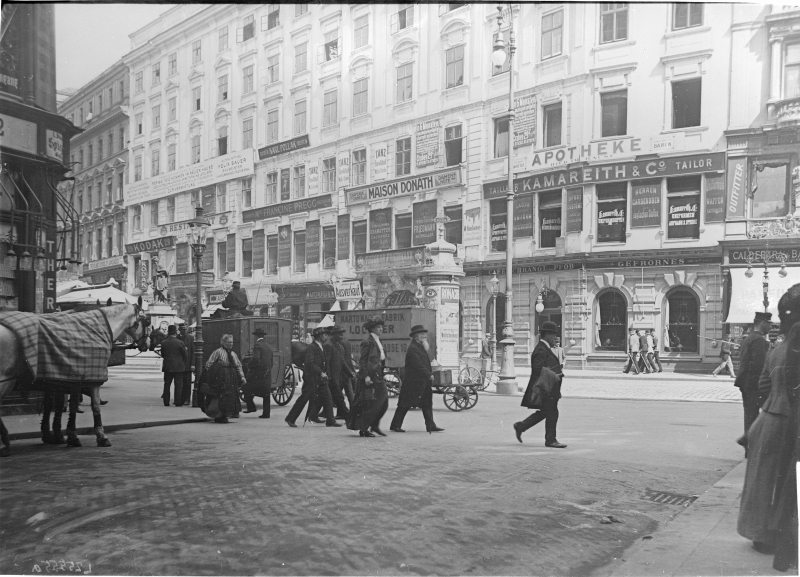 The destruction of the building was begun in May 1911 (A-Wn, 97.452B). Seventy years ago Hermine Cloeter was granted access to several valuable primary sources related to the Trattnerhof. 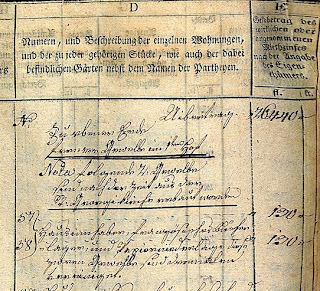 These documents consisted of seven volumes of rental ledgers, covering the time from 1777 until 1861, the plans (for whose drawing up the foreman Johann Michael Anthofer in 1777 was paid 24 Austrian ducats) and the handwritten "Summarische Bau-Rechnung des Edlen von Trattnerischen Freyhofes in Wienn" (a complete account of the expenses in the course of the building's construction). As stated above, Cloeter probably could not directly consult the rental records which weigh about 20 lbs per volume and back then were probably not located in Vienna, but in the Styrian town of Frohnleiten. The owner of these sources was Baron Franz Mayr von Melnhof (1888-1957), then head of the Mayr-Melnhof company, which today is the world's leading producer of coated recycled carton. According to Cloeter, Mayr-Melnhof described himself as being "Trattner's great-grandson", but this is of course genealogically impossible. Franz Mayr von Melnhof was Johann Thomas von Trattner's great-great-great-great-grandson. His grandmother was Mathilde von Tinti (1838-1900) whose mother, Baroness Maria Barbara von Lederer, née von Trattnern (1806-1878), had been Johann Thomas von Trattner's great-granddaughter. In the early 1950s Cloeter received an angry phone call from Mayr-Melnhof who accused her of having never returned the valuable "Bau-Rechnung" ledger. Cloeter was highly irritated and sent Mayr-Melnhof copies of the 23 photographs of the book that had been made in 1944. In 1955 Cloeter eventually found the receipt she had received in 1944 from a secretary of the publishing house of Carl Ueberreuter, which proved that she had indeed returned the book to its owner. The rental ledgers of the Trattnerhof were never accessible to Mozart scholars again. 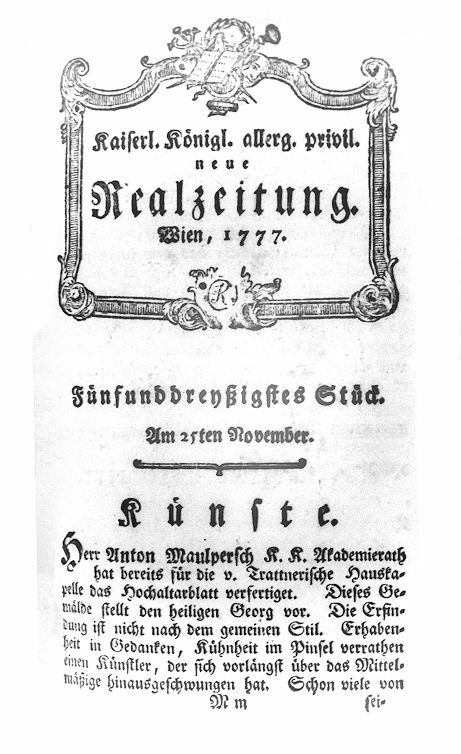 Concerning the volume that contains the 1784 Mozart entry, Deutsch writes in his 1961 edition of the Dokumente: "Zinsbücher des Trattnerhofs, früher bei Franz Mayr-Melnhof, Wien. Seit Hermine Cloeter den Band III (1782-1790) für ihr Trattner-Buch (Wien 1952, S. 99 ff.) benutzt hat, ist es in Verstoß geraten." 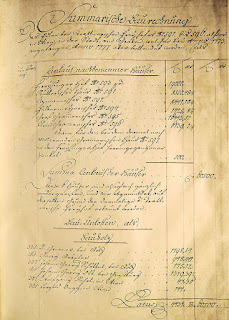 ("Rental ledgers of the Trattnerhof, once held by Franz Mayr-Melnhof, Vienna. Since Hermine Cloeter used vol. III for her book on Trattner, it is missing."). I do not know what efforts Deutsch actually undertook to locate the Trattnerhof rental records, but his statement seems rash and too pessimistic. 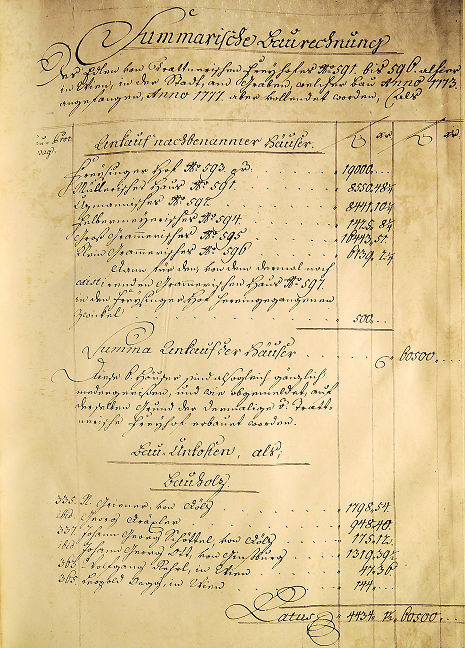 In 2004 Anthofer's plans of the Trattnerhof and the volumes V-VII of the rental ledgers (beginning in 1799) were donated to the Municipal and Provincial Archives of Vienna. The fact that these documents actually survived into the twenty-first century makes it very unlikely that the remaining books are lost. Further research concerning the current owner of the still missing early volumes of the records is unfortunately forestalled by the archivist in charge who refuses to disclose the identity of the donor of the extant material. Inquiries with the Mayr-Melnhof-Saurau family in Frohnleiten (for which I am grateful to Dr. Hermann Zieseritsch) unfortunately yielded no positive result. 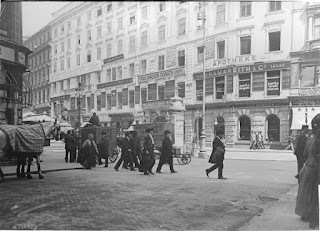 The survival of the sources in the Vienna City Archive however, still nourishes hope that the records concerning the first two decades of the Trattnerhof may be extant. The priceless handwritten "Bau-Rechnung" is lost. It only survives in form of the photographs that in the 1950s Hermine Cloeter sent to Frohnleiten. 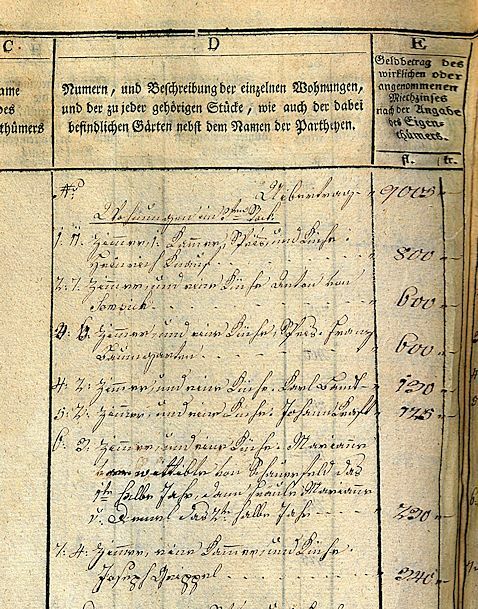 This photocopy of the original 1777 ledger was also donated to the Vienna City Archive. Cloeter also made a handwritten copy of the Bau=Rechnung which survives in her partial estate (ZPH 309) in the autograph collection of the Vienna City Library. 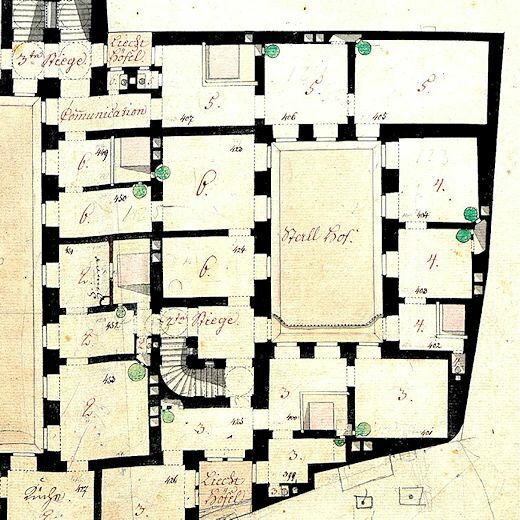 Five of Peter Mollner's original 1773 designs of the Trattnerhof (two groundplans and three elevations) are held by the Niederösterreichisches Landesarchiv in St. Pölten among the files called "Hofresolutionen in publicis" (A-SPnl, Hofresolutionen 1770 Oktober Nr. 3) which are a part of the starkly reduced holdings of the "Maria Theresianische Verwaltung". The plans belong to a submission by the City of Vienna to the Lower Austrian Government regarding a permission for Trattner to replace the Freysingerhof with a new building. 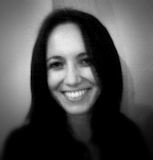 This blogpost is dedicated to the memory of my beloved friend and colleague Alison Jayne Dunlop. To paraphrase Haydn's words about Mozart: in 100 years musicology will not get such a talent again. Alison was a soulmate in countless fields. My life will never be the same again without her.